31 And he said to them, ‘Come away to some lonely place all by yourselves and rest for a while’; for there were so many coming and going that there was no time for them even to eat. I’ve been running on empty for the past few weeks. It wasn’t something that I planned, but time flew away from me and the next thing that I noticed–I was moody and cranky, and honestly I just wanted to sit somewhere and cry (or stare at a wall for a very long time). I know I am not the only one who goes through something like this–life just doesn’t seem to slow down, and it’s usually one thing after another. Well, this weekend, I’ve just about had it. I was having a conversation with my husband about it, and it was a sad reality that I was facing; I was sitting on our bed, and I was just beat–I didn’t want to do anything. I didn’t want to cook (even though I did) and I didn’t want to play with the kids (which I did anyway). Honestly, praying was something that was just difficult for me in the past couple of days. Last week was just crazy for me. We ended up having the windows replaced in our place. When the men came (with all the tools) and saw that it was going to be an all day thing–I packed the kids up, kissed my husband goodbye, and spent the day out with the kids. The goal was to come back when the men have finished and cleaned up. That meant–Aquarium, Bookstore, and other places that I don’t usually go to in one day. Oh, and two hours waiting while the youngest one took a nap in the car. That was my personal breaking point. When the men for the window came and saw that I was packing up the kids to leave–they almost looked relieved. My neighbors had done this before (I live in a Co-Op) and it was an all day event. I just didn’t want the kids to get hurt, or heaven forbid fall out the windows! After all that running around, I was honestly done. I didn’t want to do anything for the rest of the month. My introverted self was d.o.n.e. Personally, I can’t stand it when I allow things to get like this. It’s like, I make things worse by saying, “How and why did you let it get so far?” But we all know how it happened. I truly felt that Sunday’s Gospel was picked just for me. It really hit home. I was already at that breaking point when I just couldn’t enjoy myself anymore. No amount of books, knitting, or staring into the nothing was going to correct that. 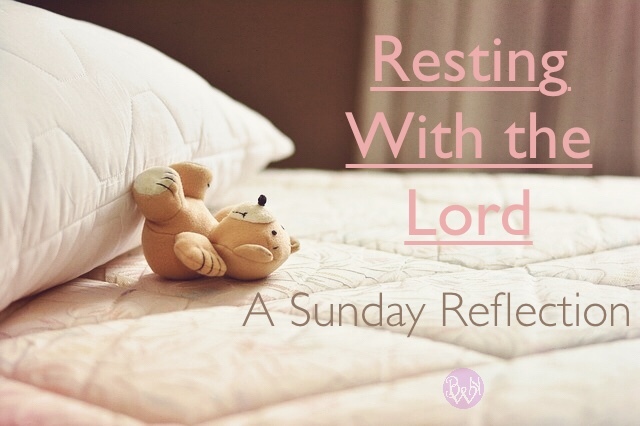 In the Gospel, Jesus tells his Apostles to come with him and get some rest. They know what it’s like to be busy–they didn’t even have time to eat! (Sounds like my life). Without having had enough time to prepare wholesome foods, and sleep (!!! ); my body is just running on empty. I am reminded that the work is always going to be there. I don’t have to be always “on.” It’s okay to shut my light off too! When I don’t take the time out to recharge (as my priest said it in his homily–you crack). I was already beyond cracking–I was breaking. My family, marriage, and children will all be better if I just relax. I used to know how to do that–when my youngest was taking two naps. Now that he’s down to one–my other children require that extra time to finish their homeschool. At the end of the day, I realize that I haven’t been taking a good care of my personal needs. Especially with all the hats that I’ve been wearing lately. Sunday’s Gospel helped me see that (thanks be to God ) because I was honestly too blind to see that myself. So hopefully, the next set of goals for the next two weeks is to relax so that my children can have a good mama for homeschool. Have you pushed yourself beyond your limit? What do you to snap back?